The Wish List is back! You may remember that we had a “Wish List” page in the past, listing the wishes and requests from you. This was a very useful list, allowing us to implement the most demanded features. We are glad to introduce the new Wish List! More versatile and nice-looking, it is available on every account page. Powered by UserPowered! You can access the widget by clicking on blue “Wish List” button at the right of the screen. All old wishes have been imported into a new widget! We will be glad to get more feedback from you. If you have a wish, or request, or something to report, drop your voice into the new Wish List. Having a feedback is important for us, so we will raffle off the free bot subscriptions every month for feedback authors! The details will be announced later, but you can start posting right away. Thank you for reading down there! Let us reveal a secret: the UserPowered tool is just developed by us, the SmartBots team. 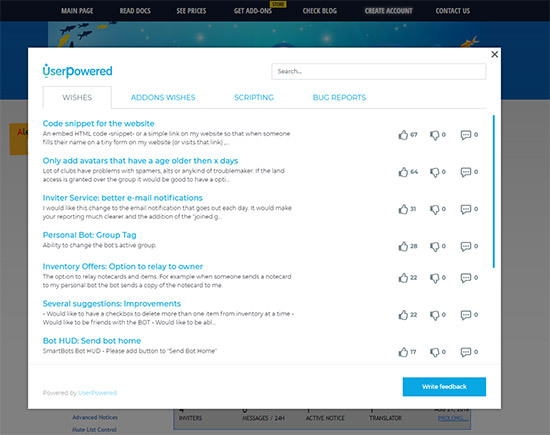 If you have a website and like UserPowered – welcome to try it now! We promise to give a free life-time subscription to all SmartBots users, just drop us a word. Welcome to UserPowered!